"Both dogs are amazing, loving, sweet, affectionate and gentle." Five dogs were living alone on one property, three in the flooded basement and two in the shed, just waiting for someone to remember that they were there. Rescue Dogs Rock NYC heard about the abandoned dogs and knew they had to help. "They have no human contact and get fed when someone shows up, which is approximately three times per week," Stacey Silverstein of Rescue Dogs Rock NYC told The Dodo. 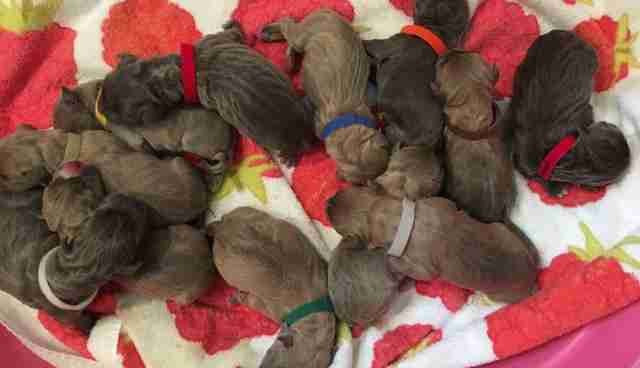 Despite only caring for the dogs occasionally, their owner was reluctant to give them up, but finally rescuers were able to save one dog, Pocahontas - just in time for her to give birth to 12 puppies. Eight of them survived. 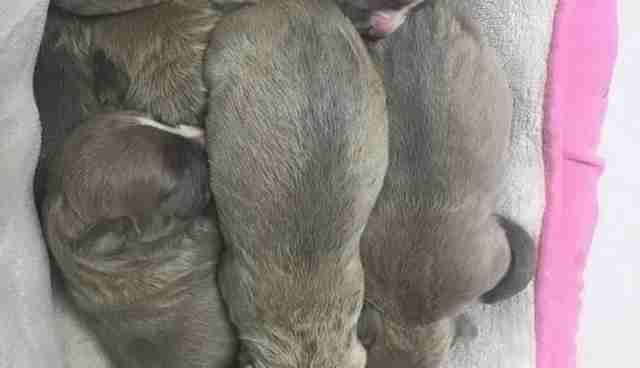 Pocahontas has been a fantastic mother to her puppies, and the little family is getting stronger every day. 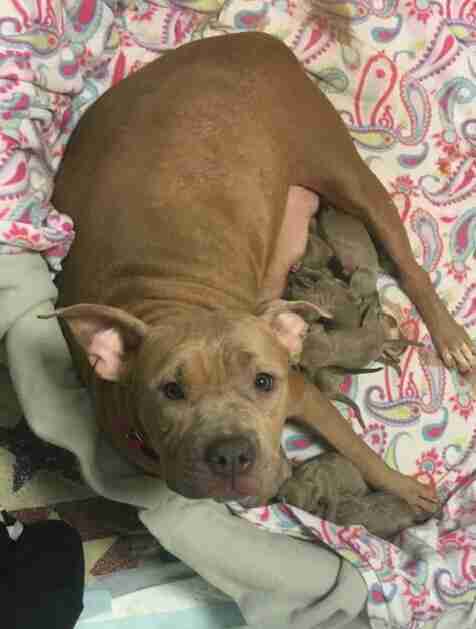 It was a happy ending for Pocahontas and her babies, but the four other dogs who'd been living on the property still needed help achieving their happy endings, too. The next dog they focused on rescuing was Queen - who turned out to be Pocahontas's mom. 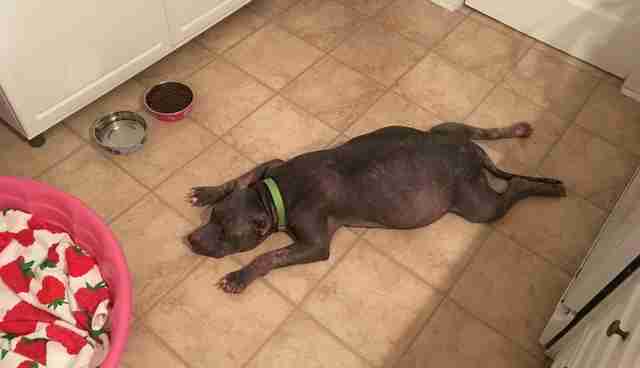 "We were able to remove Queen shortly thereafter and she went directly to our vet in Brooklyn where it was discovered that she was pregnant as well," Silverstein said. 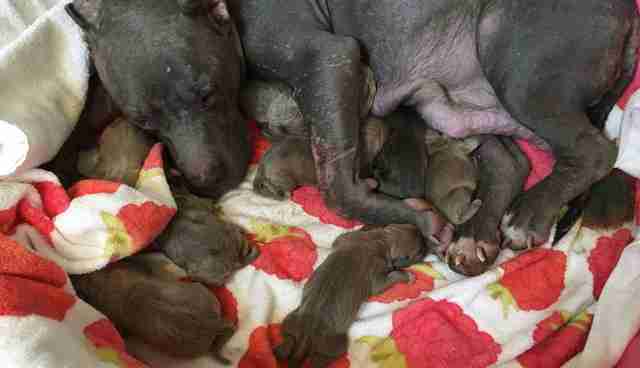 After spending a week relaxing safely in her new foster home, Queen gave birth to 13 puppies, 12 of whom survived, six boys and six girls. 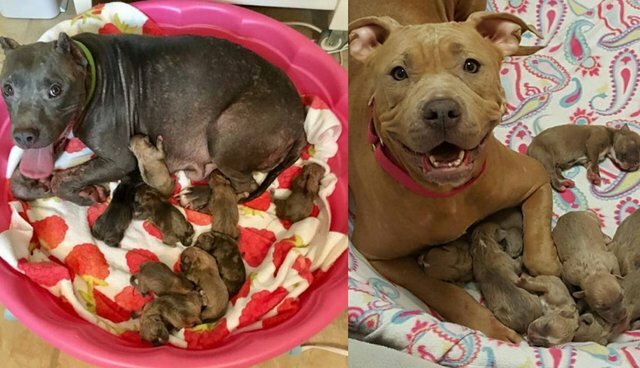 Queen is just like her daughter Pocahontas and is being a wonderful mother to her new puppies, and it's safe to say that Pocahontas learned from the best. "Both dogs are amazing, loving, sweet, affectionate and gentle," Silverstein said. "We have been unsuccessful to rescue the others but we are still trying." Thanks to their rescuers, Pocahontas and Queen will never again have to go back to that flooded basement, and their puppies will only know happy lives with loving families.